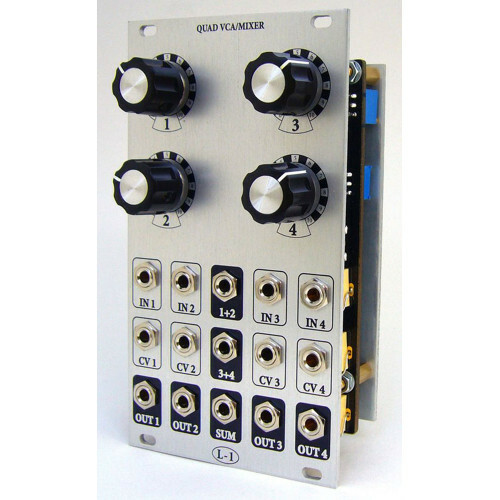 An easy to build 4-channel amplifying mixer/attenuator with 2.0x gain and 5.0V offset on each channel in an 8hp module. No calibration required. Ampmix was designed as a handy CV mixer and processor with good precision, high input impedance and buffered outputs. It could be upgraded for even better precision as described in the assembly manual. It will also work great with audio, even with full gain giving some distortion possibilities or gaining external gear. With up to 2.0x gain on each channel. If you chain channels you can get greater gain. You can chain any combination of channels it doesn't have to be in the described order. Patch signal to IN1, OUT1 -> IN2 and OUT2 have 4x gain total. Chain OUT1 -> IN2, OUT2 -> IN3 and OUT3 have 8x gain total. Chain OUT1 -> IN2, OUT2 -> IN3, OUT3 -> IN4 and OUT4 have 16x gain total. An offset voltage is generated then normaled to the inputs of the 4 channels, giving them a maximum of 5V out each with knobs turned full clockwise (2.0x gain). Please note that these offsets will affect the mixing if the channel hasn't been patched on its input or output, so turning all unused channels fully counter-clockwise/left (off) is advisable for a clean mix. pcb to build l-1's ac/dc mixer. 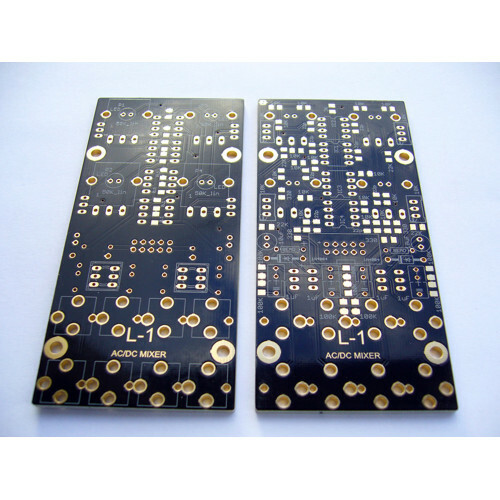 compatible with 12v or 15v systems. 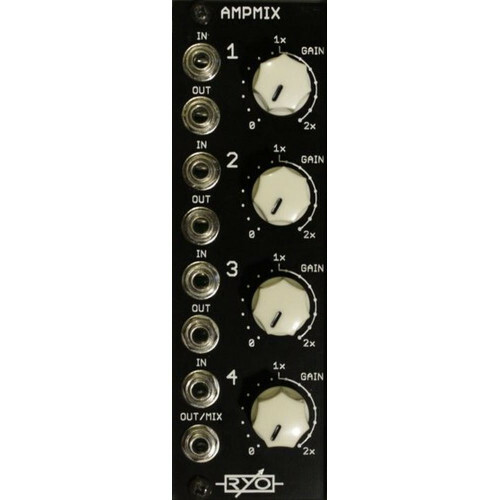 create your own panel in ..
this is the l-1 quad vca/mixer euro format, 14 hp widefull kit includes everything you need--..
new from Ljunggren Audio-- the Ampmix euro module, assembled and tested from RYO: ..
new from Ljunggren Audio-- the Ampmix euro module, pcb only (suitable for all formats) fr..